Saute the onion and mushrooms until the onions are soft, in a large, high walled skillet. Add the turkey, ham, and kale, saute until the kale wilts. Add the spices and flour, stir until all ingredients are coated. Add the milk and stock, simmer until thickened. Meanwhile, beat the egg into the potatoes. 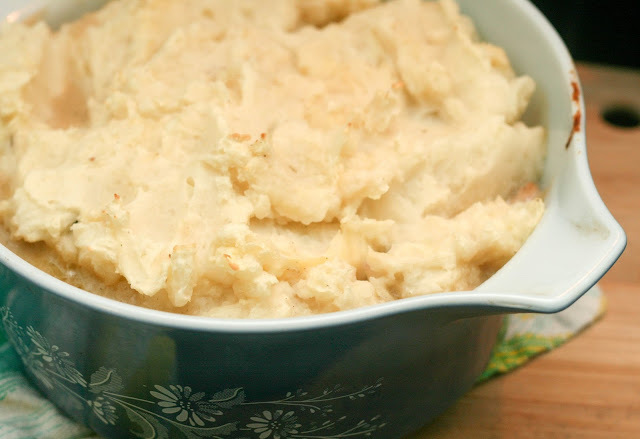 Every year I try to post some new Thanksgiving leftovers recipe (I have a ton!! Check them all out here--using up everything from turkey to cranberry sauce to potatoes to turducken) either before or directly after Thanksgiving. Since we did Thanksgiving for Two this year, I didn't have too much in the way of leftovers but I had enough for this Shepard's Pie inspired pie. Last year someone asked if I had any recipes that could use up leftover ham too, so I combined them both for this dish, but you could make it with just ham or just turkey and it would be fine. 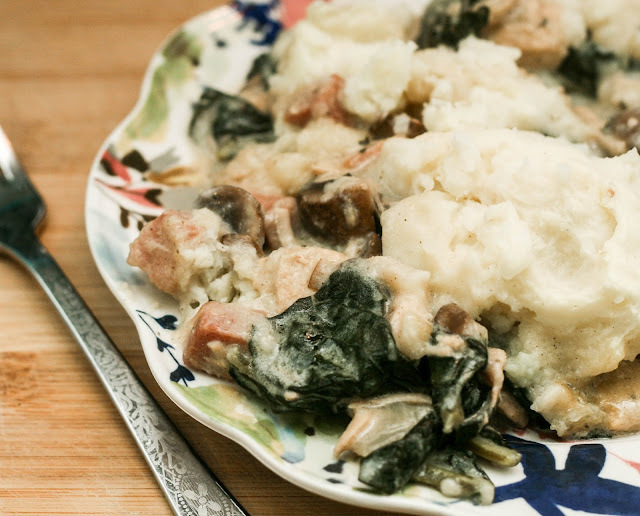 I used leftover mashed potatoes to top (or you can make fresh or use some leftover baked potatoes) and some kale for the vegetable because I thought it might be a good break from all of the carrots, green beans and corn people seem to eat at Thanksgiving. Anyway, it is super quick and easy to make and hopefully makes the most of the leftovers you have!